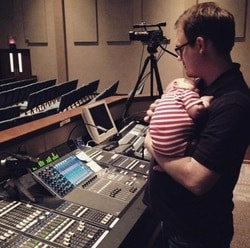 Sound - MARKEN MEDIA CO.
With a natural ear for good sound, Marcus has been running sound for church services, retreats, and special events for over seven years. He's also a student at San Antonio's Audio Engineering Institute where he is learning the technical side of sound and music including mixing, production, and Pro Tools. ​​"The Bottom Side of Down" lyrics were decades in the making. Long-time pastor (Marcus' dad) Gary L. Buckner wrote the majority of the song back in the '90s during a tough season of ministry. Recently, the Lord put it on his heart to have it put to music. Marcus, together with friend and musician Brian Anderson, drummer Alex Well, guitarist Wes Hines, and steel guitarist Tommy Detamore, produced the track. The song was recorded at Cherry Ridge Studio in Floresville, TX. Marcus recorded, edited, and mixed music for an Advent album performed by a worship band on location at Grand Parkway Baptist Church in Richmond, TX.